The Z v.5 is the second step up in our "ultra-high excursion" subwoofer lineup after the X v.2 series and replaces the world-famous Z v.4 series. The 10, 12, 15, and 18" models all feature our custom tooled and patented frames (US Patent Numbers D691596, D691597, D691598, and D741841). We mate these new platform frames to a triple stacked 234mm (9.21”) diameter motor structure with a total magnet stack height of 102mm (4.01”) featuring a hyper-extended pole and extreme clearances (allowing over 4" p-p travel before mechanical bottom effectively making it bottomless). Compared to the X v.2 motor both the top & back plates are thicker allowing for even more magnetic strength and excursion potential. This motor drives a 3" diameter 4-Layer Flat Wire Aluminum Coil wound on a thick aluminum former to incredible levels of excursion. The Z v.5 now uses the same voice coil as the NS v.3 series in the stock configuration – which means it is now a much longer 4-layer compared to a shorter 8-layer found in the Z v.4 series. The 4-Layer coil is able to shed heat faster, has a much lower inductance, and has less mass all while allowing for a higher linear excursion and thus significantly less distortion. We leveraged the much larger motor to keep total motor force similar to the Z v.4 Rev.2 while also having all of the other advantages listed prior. We do also offer an optional 8-layer coil that offers a significantly higher motor force factor & thus a lower Qts. Compared to the Z v.4 Rev.2 we also increased the thickness of the Magnet ID shorting ring by 33% to further reduce static inductance and inductive distortion over strong. Based on our years of experience with the Z v.4 series we improved the voice coil ventilation to be even more effective and feature reduced turbulence in order to reduce voice coil temperatures & increase reliability. 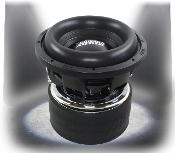 The Z v.5 series was designed from the ground-up to become the new standard in the low-frequency / small ported box subwoofer category in this price range. They will work in the same small enclosures that you are used to using for Sundown Audio subwoofers, although, the will tolerate enclosures up to about 50% larger than those if you desire even more low-end extension. The Z v.5 series is really a different kind of woofer due to its incredibly linear suspension. They are designed for the LOWEST level of bass extension possible in a small enclosure while maintaining extremely low levels of distortion.